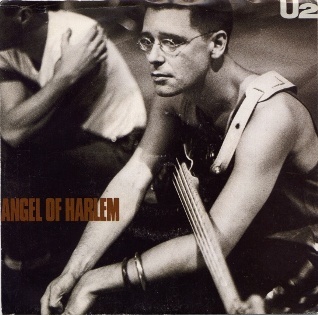 Angel of Harlem is U2's homage to the jazz singing legend that was Billie Holiday. It was released with two different B-sides; one was an original U2 song called "A Room at the Heartbreak Hotel", while the other was a live version of Rattle and Hum's "Love Rescue Me." The lyrical basis of the song is to acknowledge New York City-area landmarks, including JFK airport, WBLS radio and Harlem. It also refers to John Coltrane and A Love Supreme, the Birdland club, Miles Davis and Lady Day i.e. Ms Billie Holiday. Collectively it's U2's love letter to the blues. Check out the lyrics to All I Want Is You, Helter Skelter and Van Diemen's Land, all songs from Rattle and Hum.